Happy Monday!! I am lucky enough to have today off of work...yea 4 day weekend...thanks work =) Nothing too exciting planned for today; I have to pick something up at my grandmother's and then I'm going to go to my great-grandmother's house for the last time. She is no longer living there, her house has been sold and it closes in 9 days. I'm trying not to think about this too much...it's really sad for me. After that, I'm heading back to the city and am just going to relax for the rest of the day. I had a great weekend!! Thursday after work, I met a friend for coffee...it was the first time the two of us had been out since she had her baby. Friday morning, I drove home for the weekend. My brother was also home, so it was nice to spend time with him. Lots of family time this weekend. We went to my grandmother's on Sunday for Easter and went to my other grandmother's afterwards, where I got to see my uncle and new aunt. The more time I spend with my aunt, the more I like her...she's turning out to be really funny and a lot of fun, plus super nice. I also met a friend for coffee...always nice to catch up. Something else I did this weekend? I booked a trip to Cuba for May!!! I'm going with the friend I had coffee with while I was home. We have been talking about this trip for months and have been patiently waiting for everything to align so we could go...it FINALLY happened!! I'm so excited and can't wait!! I have a crazy week ahead of me...this is my work other half's last full week with us, so it'll be busy getting ready for her to leave and getting a handle on her files. I have a couple of alumni meetings this week and Brock Alumni have been in a trivia team at a local pub! It should be a ton of fun...really looking forward to it. I have a high pressure, stressful job. With my colleague leaving and some restructure within our organization, I am now expected to do the job of three people. My job has recently become more pressure and more stress. I am taking on too much responsibility. But I can't be afraid to try. I know that I am good at my job and I know that I can handle everything that is being thrown my way. I need to remind myself to have faith in myself and faith that it will all work out. 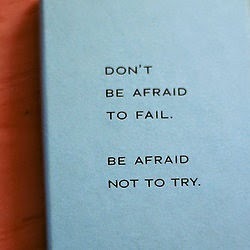 I need to remind myself not to be afraid to try...because if I don't try, I can't succeed. I'm jealous of your Cuba trip! My parents are heading there in a couple of weeks and I'm really regretting not booking with them. I think we're going to try to go with them next year. Fingers crossed! Cuba?!?! Holy cow that's awesome!!!! !